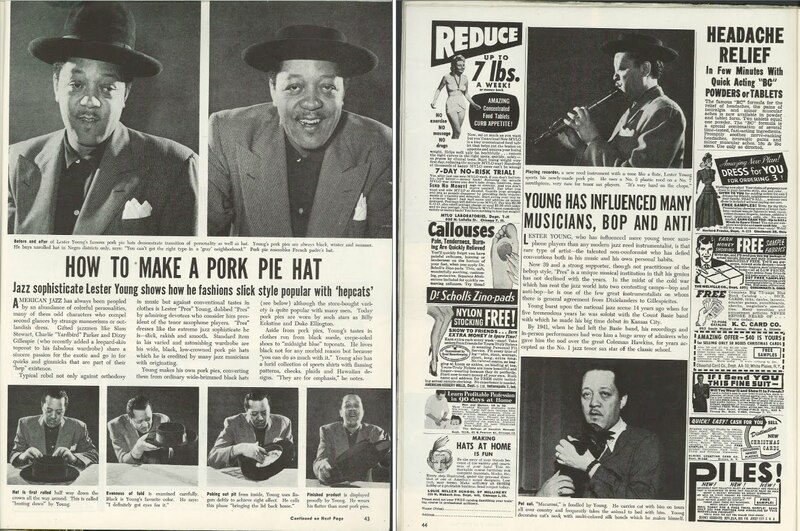 ... and so began the bitter rivalry between Lester Young and Louie Miller (see ad on bottom right). Damn right you can't buy good hats "in a 'gray' neighborhood". Disappointingly, Google image search comes up with no hits on Diz in his new leopard-skin topcoat. You've got to bring the lid back home, no question! However, I've never really liked the term "Gillespieite." That's just too many contiguous vowels, but if you remove them you can end up with "'spite." I prefer "Dizzyfan," personally. I am thinking Craig would make a memorable impression if he wore a pork pie next time he goes to court. And a leopard skin topcoat! I'd get thrown the slammer. Literally. @cafreema: At least you guys don't have to show up in robes and powdered wigs anymore. Craig does have a wig that he uses for modeling.